Le Chai Winemakers: Bottling, bottling and a bit of bottling!!! 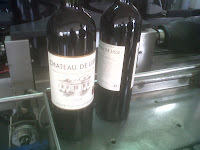 Once again an early start and the first bottling today is Chateau Camail 2009 way out in the Premières Côtes de Bordeaux region near Sauternes. This is another great little find, heaps of cassis and the palate is so smooth with lovely rounded tannins, ready to drink now! 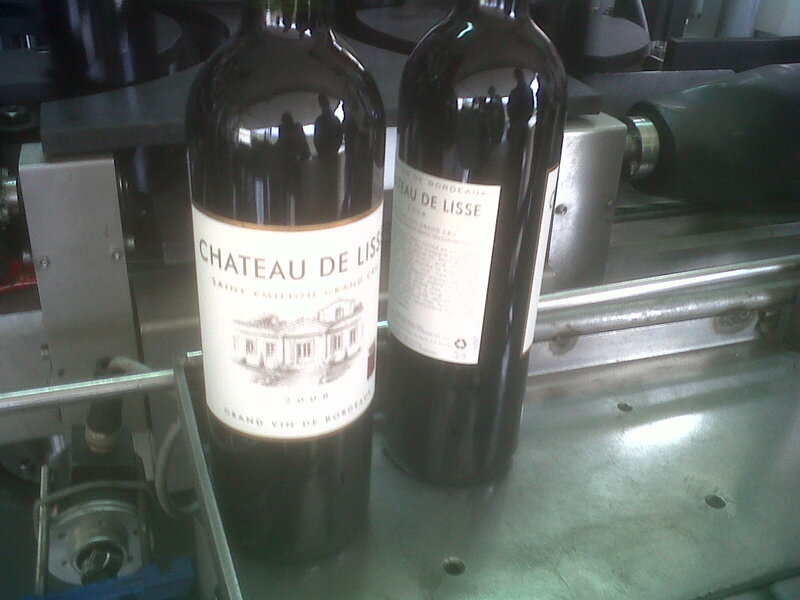 Next stop is Saint-Emilion and Chateau De Lisse. The Todeschini brothers own this place and they are waiting for me to give the green light to start bottling. 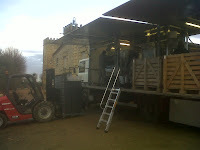 The mobile bottling plant and bottles, corks, labels and boxes are ready to go and I taste the wine after the filter and make the important ‘cut’ (when the wine tastes perfect) and away we go, minutes later the first bottle is my hand! This is classy stuff and my advice is to reserve some asap. Back in the Chai car and off to Montravel just near the Chai to do the ‘taste off cut’ for the long waited ‘Part du Boucher’ wine, minutes later the first bottle is again in my hand! The label is fantastic but I find it hilarious that although JMS isn’t here his face is everywhere you look! 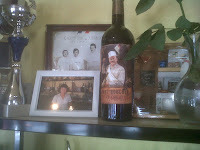 Jose from barrel company Remond gave me a call for lunch so I took JMS with me! Our local restaurant and general hub of activity ‘Le Voyageur’ loved the label and JMS is now firmly on the shelf with the Chefs prized ‘boules’ trophies! Back to the Chai and Petit Denis is extremely pleased as the new barrels have arrived and he gets busy squirreling them away into the Dordogne Chai. Libby and I are invited to a house warming party at the Todeschini’s this evening and we can’t wait as they always make a brilliant night with superb food and if we’re lucky they might pull out some great wines from their secret cellar!